Background: Video games have been shown to improve eye-hand coordination, spatial visualization, manual dexterity, and rapid mental processing, which are important in the acquisition of laparoscopic skills. 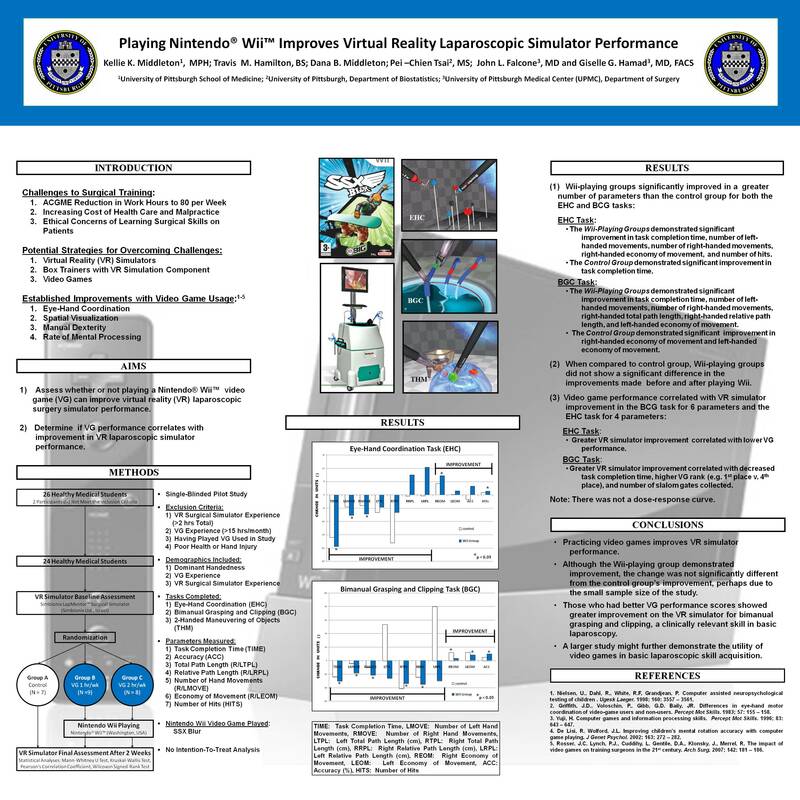 The primary goal of this study was to determine whether or not playing a Nintendo® Wii™ video game (VG) would improve virtual reality (VR) laparoscopic surgery simulator performance. The secondary goal was to determine if VG performance correlates with improvement in performance on a VR laparoscopic simulator. Methods: This was a single-blinded pilot study conducted with 24 healthy medical student volunteers. Participant demographics and characteristics were collected including dominant handedness, prior VG experience, and VR surgical simulator experience. Participants’ VR laparoscopic skills were assessed at baseline on a Simbionix LapMentor™ Surgical Simulator (Simbionix Ltd., Israel). The 3 tasks completed measured eye-hand coordination (EHC), bimanual clipping and grasping skills (BCG), and two-handed maneuvering of objects (THM). Assessment of VR laparoscopic skills was based on the following simulator-derived measures: task completion time; accuracy; path length; number of hand movements; economy of movement; and number of hit targets (EHC only). The students were randomized into 3 groups: Group A was the control group; Group B played the Wii™ 1 hr/week; and Group C played the Wii™ 2 hrs/week. The video game played was SSX Blur. All students were reassessed at the end of the 2-week study. Statistical analysis included a Mann-Whitney U test, Kruskal-Wallis test, Pearson’s Correlation Coefficient, and Wilcoxon signed-rank test. Results: Wii playing groups significantly improved in more measures than the control group for both the EHC and BCG tasks. In the EHC task, the Wii group improved in five measures; and the control group improved in only one measure. In the BCG task, the Wii group improved in seven measures, and the control group improved in only two measures. Compared to the control group, the Wii group did not demonstrate any significant differences in the improvements made before and after playing the Wii. Video game performance correlated with VR simulator improvement in the BCG task for 6 measures and the EHC task for 4 measures. There was no significant difference in possible confounding factors such as gender or past video game experience. Conclusions: Practicing video games improves VR simulator performance. Although the Wii-playing group demonstrated improvement, the change was not significantly different from the control group’s improvement, perhaps due to the small sample size of the study. Those who had better VG performance scores showed greater improvement on the VR simulator for bimanual clipping and grasping, a clinically relevant skill in basic laparoscopy. A larger study might demonstrate the utility of video games for basic laparoscopic skill acquisition on a VR simulator.